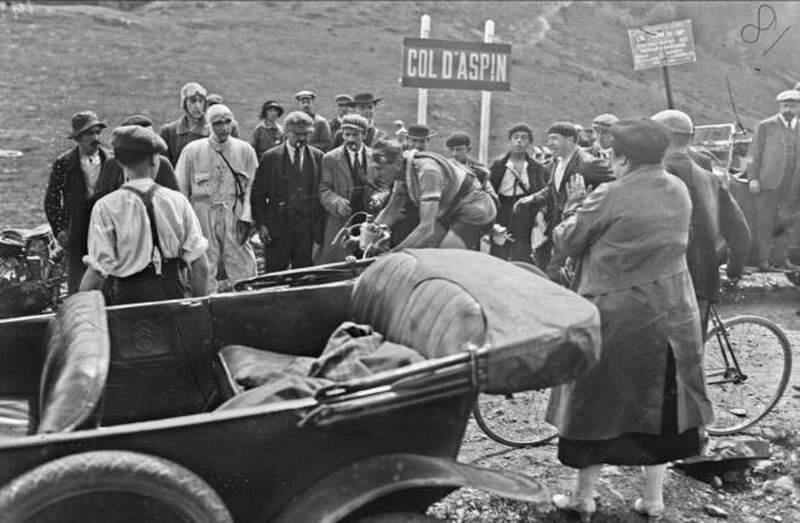 Today’s historic photo of the day: on Wednesday, July 5, Frenchman Jean Alavoine (Peugeot-Wolber) crosses over the Col d’Aspin during the Tour de France 1922, stage 6. It was a monster 326-kilometer stage from Bayonne to Luchon, which contains three major climbs: Col d’Aubisque, Col d’Aspin, and Col de Peyresourde. Alavoine won the stage in 14 hours 28 minutes and 44 seconds. The second finisher, Victor Lanaers (Automoto) came 16 minutes 43 seconds behind. The overall winner, Firmin Lambot (Peugeot) came third, at 31:05. Jean Alavoine atop Col d’Aspin. Tour de France 1922. After stage 7, Jean Alavoine took the maillot jaune and kept it until stage 12. After stage ten, he was leading the rage with 22:18 margin over Lambot. In stage 11, he suffered from mechanical problems and his lead dropped to 6:53 minutes. In stage 12, a 371 km going from Geneva to Strasbourg, Alavoine lost 37 minutes and the lead. In the end, he finished the tour in second place. Next year, during the 1923 Tour de France, he engaged in a fierce battle with the Italian legend Ottavia Bottecchia (Automoto) and Henri Pélissier (Automoto) for the overall classification. After stage ten, Bottecchia was leading the race with only 12 min 19 sec over Jean Alavoine (a small margin for those years). But, in stage ten, a 275 km going from Nice to Briançon, he fell in the descent of the Col d’Izoard as he accompanied Pélissier and Bottecchia. His elbow was heavily injured. He finished the stage but was forced to retire the next day. Pélissier won the 1923 edition. Jean Alavoine won a total of 17 stages in the Tour de France between 1909 and 1925. Only seven riders have won more stages to date: Eddy Merckx 34, Mark Cavendish 30, Bernard Hinault 28, André Leducq 25, André Darrigade 22, Nicolas Frantz 20, and François Faber 19. He retired from sport in 1925, but he continued competing occasionally. On July 18, 1943, he went to Sannois, near Paris, for a criterium of veterans. During the race, he felt sick on his bike and died a few hours later at the Argenteuil Hospital, aged 55.